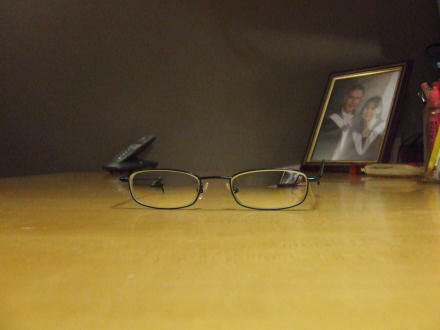 My glasses sitting on Jane’s desk. I’ve been wearing glasses since I was 8 years old; I was in Primary 4. I remember that because my teacher at that time was called Miss Dickson and over a couple of months she progressively moved me back further and further towards the rear of the classroom for talking. Since then I’ve been a signed-up and permanent member of the Specky Four Eyes Club™. 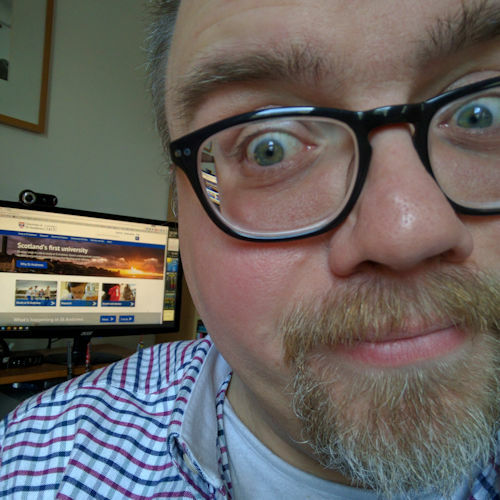 And before you ask I wouldn’t consider contact lenses for two reasons: first, my eyesight is too bad for contacts (these glasses were partly paid for me by the NHS because I’m so blind), and second, I can’t stand sticking anything into my eyes. I’m due for another eye examination soon. Better, worse or just the same? We’ll see, but sadly I suspect worse.